Molding/Casting Quality: Molding accuracy is very good, with notable exceptions of small parts that require extensive trimming and cleaning. Detail: Detail work in resin moldings is outstanding. Accuracy: As this is the only model kit of the LK available – excellent. Fit: Part fit was excellent overall, with some adjustments needed. Ease: This is a seriously challenging kit, as is not meant for beginners. Decals: Decals recommend an overcoat of clear film prior to use. Overall: The challenge is rewarded by the excellence of the end-product. 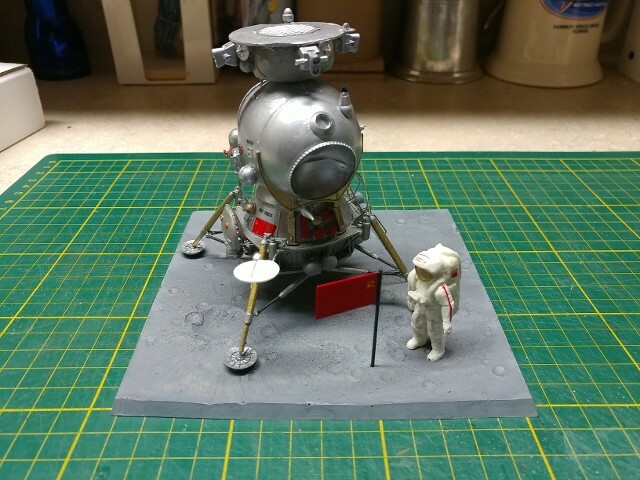 After decades of denial about their failed Moon-landing program, the Russians have finally brought some of their un-flown space hardware out into the light of day. 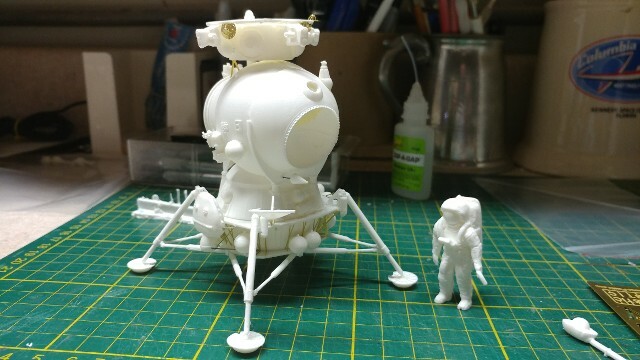 Fantastic Plastic is the first, and as far as I know, only provider of a model kit of the Soviet-era moon landing craft, the “LK” for "Lunny Korabl" or Moon Ship. 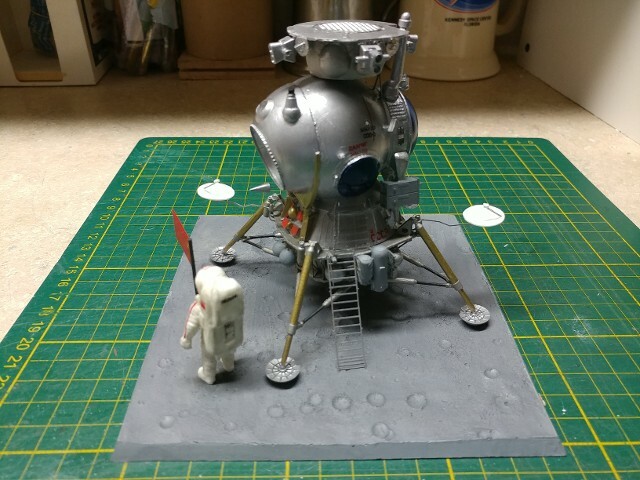 Done in 1/48 scale, the same scale as the Monogram “First Lunar Landing” model, as well as later Dragon Models Lunar Modules, it shows a direct comparison to the Grumman Lunar Module (LM) flown in the U.S. Apollo Program. A contrast that becomes very clear in the very primitive and direct look of the LK when placed near the LM. 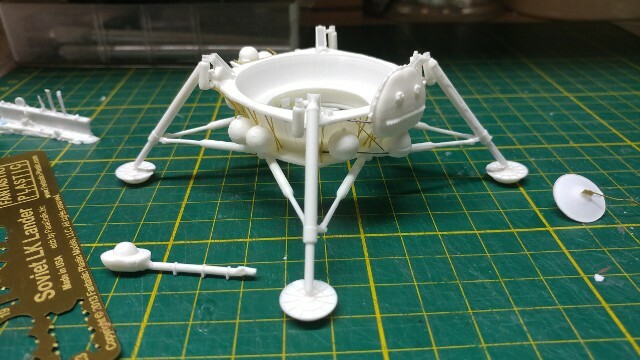 The kit is primarily a resin kit, but has a photo-etched metal detail sheet included, which provide a number of critical detail elements for the ship. The instructions are color CAD-rendered diagrams, showing part placement, provided as individual “jpg” files on an included CD-ROM. 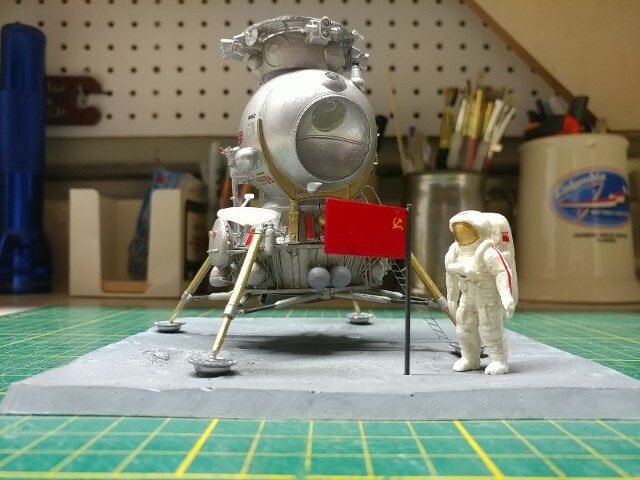 The CD also provides a number of reference photos of the real LK prototypes, currently on display in Russia, as well as the Soviet Moon Suit, for proper decal placement. The CAD Patterns were rendered by Scott Lowther. The casting of the resin parts was done by Mana Studios. The photoetch sheet was provided by Paragrafix and the decals were provided by Canuck Models. Obviously, Alan Ury of Fantastic Plastic know “who to call” when great modeling supply work is necessary. 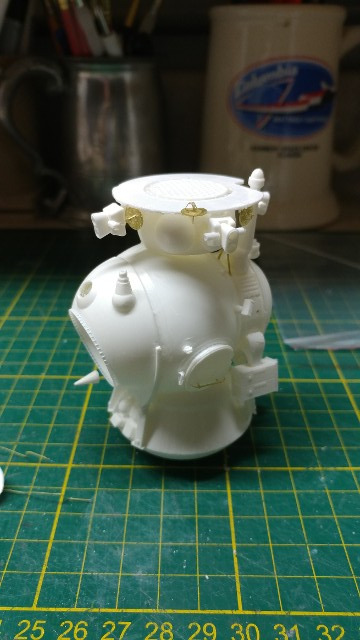 The crew cabin and propulsion elements of the LK, though this phase of the model build. The landing gear and decent consumables section of the LK. This would have been left behind on the Moon as "dead weight" for the ascent. 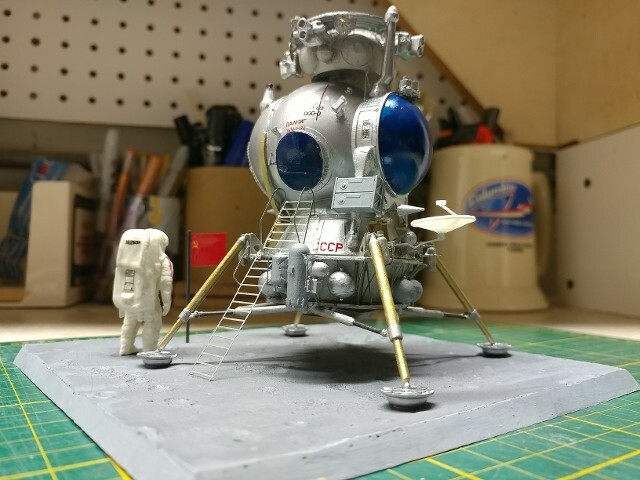 Primary assembly completed, the "Moon-suited" Cosmonaut is placed near the LK for size reference. The completed LK, resting on the supplied moonscape display base. 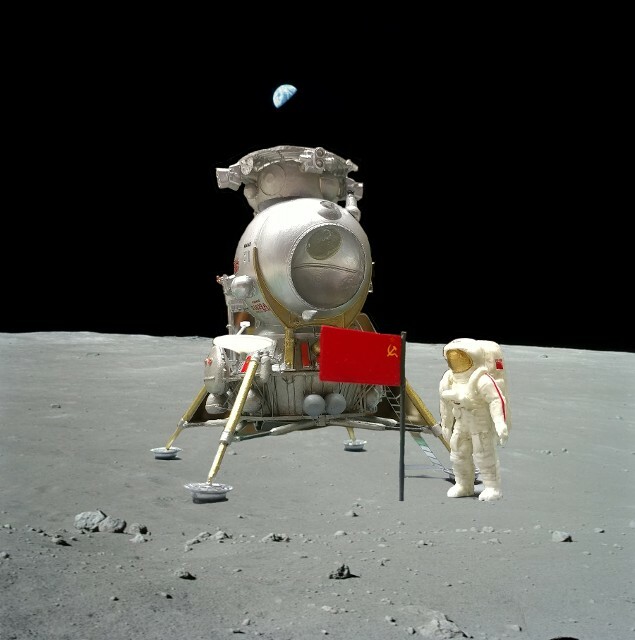 The Soviet LK, resting on the Moon's surface.